The ruling Bangladesh Nationalist Party has expelled an MP who accused the government of backing the rise of Islamic militants. It said Abu Hena had violated party discipline and tarnished its image. Mr Hena said his expulsion proved that the government supported Islamic militancy in Bangladesh. There has been a series of bombings linked to militants this year. The government says it is taking action and has banned three Islamic groups. Mr Hena has been at the centre of controversy since he accused the four-party coalition government of sheltering and patronising the Islamic militants in an interview with the BBC last week. In subsequent interviews with local media, he blamed the biggest Islamic party in the government - Jamaat-e-Islami - and some ministers and governing coalition MPs for the rise of Islamic militancy. Mr Hena's parliamentary constituency is in the western district of Rajshahi, where a number of killings have taken place since last year. The killings were blamed on an Islamic group led by Siddiqul Islam, also known as Bangla Bhai. He and his alleged spiritual leader, Abdur Rahman, the chief of the banned Jama'atul Mujahideen group, are now at the top of a list of wanted Islamic militants. Mr Hena said the government had not only turned a blind eye to Islamic militants but helped them to thrive. 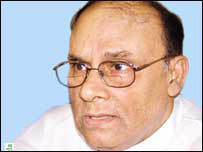 "Islamic militancy started to spread in Bangladesh soon after Jamaat-e-Islami had come to power, riding on the BNP. The militants in fact did not exist four years ago," he said. The government, under pressure from domestic opposition parties and the international community following the killing of six people in a spate of bombings in August and October, acted quickly against Mr Hena. A BNP statement issued on Thursday announced his expulsion from the party. It said the prime minister and chief of the BNP, Khaleda Zia, had cancelled Mr Hena's party membership "as a disciplinary action for his misconduct and for tarnishing the image of the party". The government says it is acting against Islamic militants and has arrested nearly 400 suspected members of the three banned Islamic groups.